Plate tectonics is the geologic theory that Earth's crust is made up of rigid plates that "float" on the surface of the planet. Tectonics comes from the Greek word meaning "builder." The movement of the plates toward or away from each other either directly or indirectly creates the major geologic features at Earth's surface. Plate tectonics revolutionized the way geologists view Earth. Like the theory of evolution in biology, plate tectonics is the unifying concept of geology. It explains nearly all of Earth's major surface features and activities. These include faults and earthquakes, volcanoes and volcanism, mountains and mountain building, and even the origin of the continents and ocean basins. Plate tectonics is a comparatively new idea. The theory of plate tectonics gained widespread acceptance only in the 1960s. About 50 years earlier, German geophysicist Alfred Wegener (1880–1930) developed a related theory known as continental drift. Wegener contended that the positions of Earth's continents are not fixed. He believed instead that they are mobile and over time drift about on Earth's surface—hence the name continental drift. Wegener's most obvious evidence for his theory was the fact that several of the world's continents fit together like pieces in a jig-saw puzzle. Based on this, he proposed that the continents of the world were previously joined together in one large continental mass, a supercontinent he called Pangaea (pronounced pan-JEE-ah). 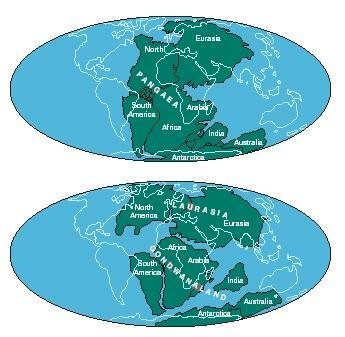 Wegener believed that this supercontinent had subsequently broken up into the six present-day continents. However, Wegener could not provide a convincing explanation as to what moved the continents around the surface of the planet. That answer came with the theory of plate tectonics. Earth's tectonic plates are rigid slabs of rock. Geologists divide the interior of Earth into layers, based on their composition (from solid to liquid). Asthenosphere: Portion of the mantle beneath the lithosphere composed of partially melted material. Convection current: Circular movement of a fluid in response to alternating heating and cooling. Convergence: The movement of two plates toward one another. Crust: Thin, solid outer portion of Earth. Divergence: Separation of two plates as they move in opposing directions. Lithosphere: Rigid uppermost section of the mantle combined with the crust. Mantle: Thick, dense layer of rock that underlies Earth's crust. Ocean trench: Deep depression in the seafloor, created by an oceanic plate being forced downward into the subsurface by another, overriding plate. Plate margin: The boundaries where plates meet. Plates: Large regions of Earth's surface, composed of the crust and uppermost mantle, which move about, forming many of Earth's major geologic surface features. Seafloor spreading: Process in which new seafloor forms as molten rock from Earth's interior rises toward the surface, pushing the existing seafloor out of its way. Subduction: Tectonic process that involves one plate being forced down into the mantle at an oceanic trench, where it eventually undergoes partial melting. Transform motion: Horizontal plate movement in which one plate slides past another. The thin outer portion of the planet is the crust. Beneath that is the mantle, which is solid near the top and "soft" or partially melted beginning at a depth of about 40 miles (65 kilometers) beneath the surface. The crust and the rigid portion of the mantle compose the lithosphere. The soft portion of the mantle is called the asthenosphere. It is the lithosphere that is broken up into plates, which move about while floating upon the underlying asthenosphere. There are about eight major plates and several smaller ones that are in constant contact with each other. When one plate moves, it causes other plates to move. These plates have many different shapes and sizes. Some, such as the Juan de Fuca plate off the west coast of Washington State, have surface areas of a few thousand square miles. The largest, the Pacific plate, underlies most of the Pacific Ocean and covers an area of hundreds of thousands of square miles. about 1 inch (2.5 centimeters) per year. The fastest plates move more than 4 inches (10 centimeters) per year. Tectonic plates can interact in one of three ways. They can move toward one another, or converge. They can move away from one another, or diverge. Or they can slide past one another, or transform. The boundaries where plates meet are known as plate margins. The types of geologic activity that occur when two plates interact is dependent on the nature of the plate interaction and of the margins. Plate margins come in three varieties: oceanic-oceanic, continental-continental, and continental-oceanic. Oceanic-oceanic plates. When two oceanic plates converge, one of the plates subducts or sinks underneath the other, forming a deep depression called an ocean trench. The subducted plate sinks downward into the mantle where it begins to melt. Molten rock from the melting plate rises toward the surface and forms a chain of volcanic islands, or a volcanic island arc, behind the ocean trench. When oceanic plates diverge, a ridge (mountain chain) develops and seafloor spreading occurs. Molten rock pushes up at the divergent margin, creating mountains and an expanding seafloor. Today, Europe and North America move about 3 inches (7.5 centimeters) farther apart every year as the Atlantic Ocean grows wider. Continental-continental plates. 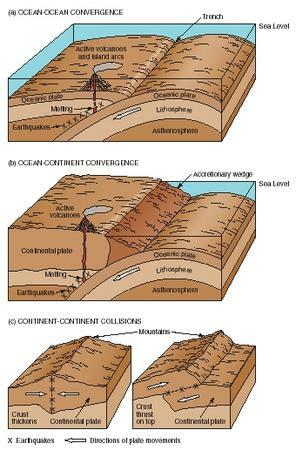 Continental-continental convergent plates act quite differently than oceanic-oceanic plates. Continental crust is too light to be carried downward into a trench. At continental-continental convergent margins neither plate subducts. The two continental plates converge, buckle, and compress to form complex mountains ranges of great height. Convergence of this sort produced the Himalayas when the Indian-Australian plate collided with the Eurasian plate. Continental-continental divergence causes a continent to separate into two or more smaller continents when it is ripped apart along a series of fractures. The forces of divergence literally tear a continent apart as the two or more blocks of continental crust begin slowly moving apart and magma pushes into the rift formed between them. Eventually, if the process of continental rifting continues, a new sea is born between the two continents. Rifting between the Arabian and African plates formed the Red Sea in this way. from the plate margin. The Andes Mountains of South America and the Cascade Mountains of North America are examples of volcanic arcs. No continental-oceanic divergent margins exist today. They are unlikely to form and would quickly become oceanic-oceanic divergent margins as seafloor spreading occurred. Transform motion. In addition to convergence and divergence, transform motion may occur along plate margins. Transform margins are less spectacular than convergent and divergent ones, and the type of plates involved is really of no significance. As two rock plates slide past one another at a margin, a crack or fault develops. The energy generated by the movement is often released in the form of an earthquake. The best known example of a transform plate margin is the San Andreas Fault in California, where the Pacific and North American plates are in contact. can i know more about convergen plate tectonic?and also all about tectonic plate?wilson cycle? This was a great article, it helped me heaps with my study on plate tectonics. I agree with James, this really is a great article!!! hello, this is great, i've learnt so much about Plate tectonics you have really helped me with my project. can oceanic plates slide past continental plates? since the earth plate is moving,is the earth expanding? Really! It is a great article he explicated in a simple form the interaction crustal in earth. Hi,This has been a great article about tectonic and it has helped me so much with my geography homework and science project. And i want to learn about tectonic plates. Very helpful. I am trying to link Geology with the current social systems and the seismic shifts we are experiencing in finance and world powers. I really thought that this site was helpful. Thank you so much. I'm a 7th grader working on homework and we are studying earthquakes, volcanoes, and plate tectonics. This helped a great deal! This has been great, it is great when you are actually taken to a helpful artical of the exact question that was asked! I NEED HELP WITH MY HOMEWORK!!! AND I AM CONFUSED!!!!!! This website is great! this will really help me with my project. it helped me with my homework for science.!!! Can you write more about oceanic continental divergent? (th grade is so hars so i need to know more! Thanks guys, I have this big project due soon, and this really helped! good information it helped me a lot on my science homework. Yeah I like this article. But for my science project I need to find out which way South AMericas tectonic platse she either vertical or horizontal? Sam with Africa. Which the feature can be apper during Plate Tectonic Theory? why the deepest oceanic trench (11,034m) of the world name Mariana Trench? Its nice i have learn a lot..what about the basic process involved in plate tectonics? Slab Pull- process in which the leading edge of the sub-ducting plate pulls the plate along with it. wow. this is so helpful man! :)everyone should come and look at this! WHAT ARE THREE KEY POINTS OF THE THEORY OF TECTONICS? RESULT IN THE THE MOVEMENT OF EARTH`S PLATES? I HAVE A QUESTION ABOUT MOVEMENTS OF TECTONIC PLATES. WHAT IF IS THERE ANY PLATES MOVEMENT AS OCEAN-CONTINENT CONVERGENCE,IS IT POSSIBLE? can we know about plate tectonics? wow! like no joke this web site helped me in various ways. i appreciate this who ever made it :) thanks> my homework is easy now!! good job just not what iwas looking for i wanted examples of plate tectonics. Thank a lot. Can u help me with more explanation under volcanoes, earthquake and mountain formation. The theory of plate tectonics has done for geology what Charles Darwin's theory of evolution did for biology. It provides geology with a comprehensive theory that explains "how the Earth works." The theory was formulated in the 1960s and 1970s as new information was obtained about the nature of the ocean floor, Earth's ancient magnetism, the distribution of volcanoes and earthquakes, the flow of heat from Earth's interior, and the worldwide distribution of plant and animal fossils. Thanks for the info ! this is awesome huh ! it helped me with my project !! Thanks for the website!!! It really helped with schoolwork and everything. Great article. It was good to read a simplified version of the topic to compare my notes to. I think some more explanation of subduction is due though. I want to know more about plate tectonic with diagram. Why do plate tectonics of the earth exist?why do we have the current continents of the earth? You are so good that in your explanations and best examples i get easy time to understand this geographical concepts that are scientifical. may i know about the benefits of the continents of world;why do the plate tectonics exist in the world.thank you. thank for the information , i understand the explanation that you share not only for me but to all people, thank you ! Does anyone know how earth's crust and tectonic plates make a geological event? What are some examples of plate tectonics?I need this for my homework. I am a 6th grader and this helped me a lot for my science project! Thank you so much! I am a Geology student @ South Eastern Kenya University in Kenya. It was so helpful in doing my research.